For the couple who is ready to get out and enjoy nature, then this Flagstaff Micro Lite 19FBS is ideal for you! 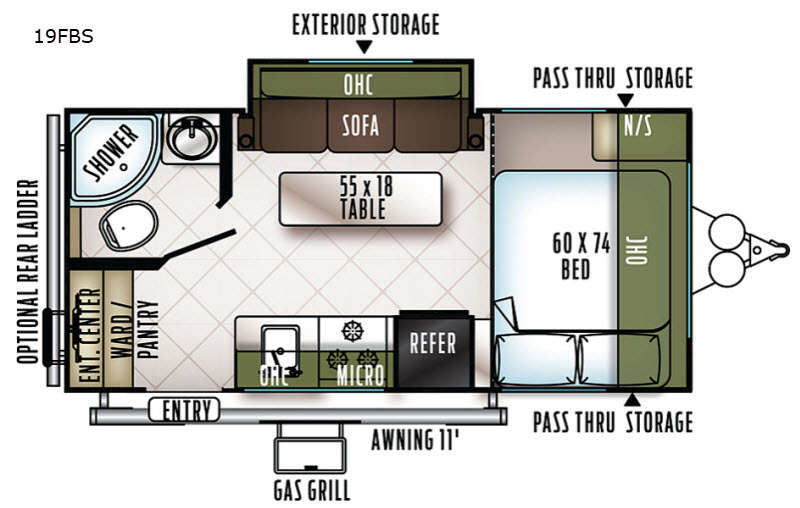 This travel trailer has all of the basic amenities from the rear bathroom with a radius shower to the front 60"x74" bed. The sofa is within a slide out and in front of the sofa there is a 55"x18" table where you can enjoy your meals. In the evening plan to grab your camp chair, a snack, and enjoy the sunset while sitting under the 11' awning! 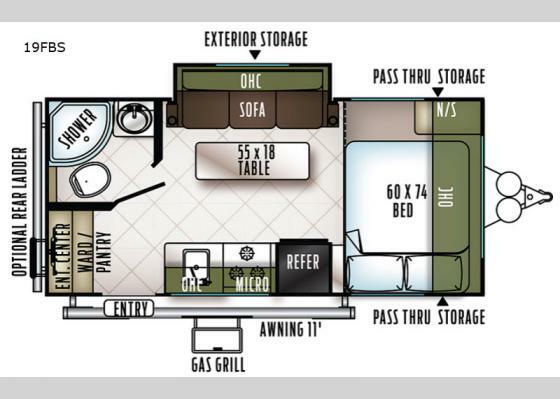 The Standard Package H is available for this model and includes features such as a single door refrigerator, outside speakers, a heated mattress and more! For any camping trip you will want a Flagstaff Micro Lite travel trailer! These models have a beautiful Slatewood interior with Hardwood cabinet doors and drawer fronts. Each unit features solid surface kitchen countertops, a three burner range with a glass stove top cover, and a WIFI Ranger WIFI Booster Sky 4, so you can stay connected while you camp. Along the exterior there is a fully aluminum frame, a radius roof with interior vaulted ceilings which gives you the most headroom, plus an outside shower, and a power awning. The Standard Package D offers features such as a fully enclosed underbelly, outside speakers, a multi zone stereo with DVD/CD/AM/FM and Bluetooth control, plus so much more!